Complete Finishing Lines, Plating, Electro-less, Anodizing, any process line can be custom built to your specifications. 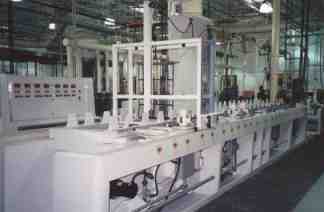 Manual or Semi Automatic Barrel, Rack, Single or multiple hoists on one line. If it's plating for the Hardware or Printed Circuit Board industry we are fully capable of building a modular plating line. Cleaning lines, copper plate, electro-less and electroplated nickel, chrome, and the precious metals like gold and silver, we have the experience you can really on to manufacture and install all types of plating equipment. Our design engineers and service technicians will work with you from the projects beginning through the installation process and far beyond. Providing a cost effective system that will meet your needs for many years. Our highly skilled Plastics division will fabricate a plating system to meet your most unique demands. Need a quote fill out and submit our RFQ form. Call R K Fabrication to speak with a technical representative and find out how we have the solutions to your industrial chemical process or ventilation requirements.